Discovering Warren's Kirch-Ford-Terrill House ~ The History Girl! Warren Township, New Jersey, after two hundred years since its incorporation, retains much of its rural, forested hills and valleys, with large lots and controlled growth. Located in the valley between the first and second ridge of the Watchung Mountains, it did not experience battles or combat during the American Revolution. General George Washington and his troops were stationed not far away along the first ridge, where they could survey the British below in New Brunswick and as far away as Staten Island. Just a few miles from the ridge, on the main road connecting the area to Morristown in the north and New Brunswick to the south, is a home that pre-dates the Revolutionary War and even appears on maps of the period. One of Warren Township's earliest surviving homes, the Kirch-Ford-Terrill House is an architectural gem that shows the agrarian development patterns of this area in the Watchung Mountains. The Kirch-Ford-Terrill House is located on the corner of Mt. Bethel and Reinman Roads. Mt. Bethel Road appears as early as 1766 on a Somerset County map. Robert Erskine was appointed Geographer and Surveyor General of the Continental Army in 1777. Following his appointment, Erskine drew upwards of 275 maps covering the northern sector of the war. His maps of the region, showing roads, buildings, and other details, were of much use to General George Washington and remain historically valuable today. Erskine's 1776 Route Maps indicate a Captain William Ford living at the house on what is now Mt. Bethel Road. For many years historians have tried to determine who exactly William Ford is. Forty-five William Fords served in the Revolutionary War, four of which lived in New Jersey. Researching deeds and colonial records have revealed information about these men's whereabouts over the course of several years. However, due to unclear and incomplete records, it is impossible to know if these William Fords were the same person or four separate persons! No definitive research has connected these men to the house, but William Ford of Woodbridge, New Jersey may have moved to the property in 1778 and returned to Woodbridge in 1794. Another possible contender is William Ford, who may have been the son of the Charles Ford, who owned land near Dock Watch Hollow Brook in l762 and donated property for a new Presbyterian Church building in Bound Brook. Charles Ford is listed as a taxpayer in Bedminster in l782 and in Bridgewater in l785-1786. 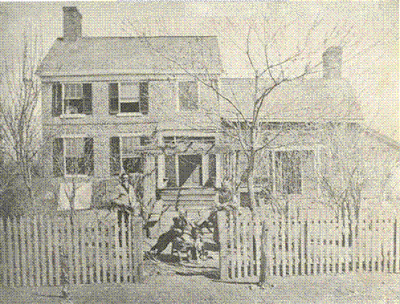 The Kirch-Ford-Terrill House, circa 1870. Courtesy Warren Township Historical Society. William Ford can be traced to living in the house as early as 1776, but the house's initial construction dates as far back as some point between 1750 and 1760. By examining the home's construction and layout, much can be gleaned about its builders. The original section of the home consisted of a keeping room and attic sleeping loft above, accessed by either a ladder or small winder staircase. The keeping room, which would have been multi-functional for the family, includes a massive ten foot wide open hearth and reconstructed beehive oven. Unique to its design is the brick ash chute, which guides ashes from the front of the oven onto the open hearth floor. At some time between 1760 and 1770, a small lean-to addition to the rear of the house provided a borning room adjacent to the hearth and another room sunken 17" below the keeping room floor level, with three steps down to its brick floor. This room, on the northern side of the house, is noticeably cooler in summer and would have been used to store food and other perishable items. It features shelving and one small window. This addition created a longer sloping roof at the rear of the house, giving it the appearance of saltbox construction, similar in design to the Silas Riggs Saltbox House in Roxbury Township and the Wick House in Morristown. In the sloping loft room above is a "secret room" which has for many years been speculated as being a hiding place for soldiers during the Revolutionary War and for slaves on the Underground Railroad. Access to this room was gained by lifting one of the unnailed ceiling boards in the corner of the borning room below it. An access door has since been added from the nineteenth century shed kitchen. However, there is no conclusive evidence to support the claim that Revolutionary War soldiers or runaway slaves used the space. Soldiers were stationed nearby the home along the ridge of the Watchung Mountains but there is no recorded documentation that the house was used by officials or soldiers during the war. As for the claims of being part of the Underground Railroad, it is known that this area of Warren was extremely pro-slavery, so it would be unlikely that slaves would travel to this home for safety in such an unsympathetic region. The "secret room" at the Kirch-Ford-Terrill House. A large two-story wing was added circa 1780 and shows evidence of having been moved from another location and attached to what was then an existing saltbox structure. This two-story wing has noticeably higher ceilings with exposed beams featuring beaded edges. After being attached, the stairway to the second floor was narrowed and reversed, the rooms widened, and the front windows reset to be symmetric within the lengthened facade. The final addition to the property was a shed kitchen believed to have been added sometime before 1870. It includes a small back room (pantry), two doors to the exterior, and three windows. A steep staircase to the loft, concealed by a door, was constructed on the south side of the hearth. On its exterior, this frame and clapboard house has a front facade of brick on the 1780 addition, a rare feature on homes in this area, possibly indicating the owner's wealth and social status. The second owner of the Kirch-Ford-Terrill House was Thomas Terrill, a farmer who held multiple positions within the newly created Warren Township. Born January 31, 1772, he married Mary Dunn of Piscataway in 1790. 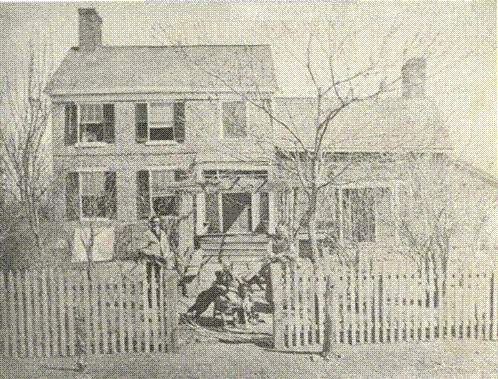 They settled in Warren, possibly at the Kirch-Ford-Terrill House as early as 1796, and together had nine children. Terrill farmed his 229 acres and in 1806 became the first clerk of Warren Township. He was reelected clerk from 1807 - 1808, 1811 - 1825, and 1830, a total of seventeen years. He also served as a member of the school board, a justice of the peace from 1816 to 1824, and then Judge of Somerset County in 1828. Terrill was also an active member of the Mount Bethel Baptist Church, serving as one of the trustees when it was incorporated in 1819. He also enjoyed the best seat in the Meeting House, paying $28.00 annually for a pew on the east side of the sanctuary, directly behind the minister’s seat. The front parlor of the 1780 wing. Upon his death in 1830, he left a personal estate valued at $2,223.89, half of it in the form of promissory notes. His extensive real estate holdings would have added several thousands in value to that, making him Warren’s wealthiest resident at the time of his death. After his death, the house was transferred to his sons Squire, Drake, and Madison, in 1831. Between 1839 and 1854, the house transferred ownership at least ten different times. In 1857, it was purchased by John Kirch, a German immigrant and builder. Kirch and his wife, Catherine, and their eight children lived in the home. Kirch built a number of structures in the area, including the Meyersville Presbyterian Church in Passaic Township. Kirch also served on the Township Committee between l876 and 1877. John Kirch passed away in l894 and left the property to his wife. Catherine willed it to her son, William, who left it to his son, Raymond. When Raymond Kirch died in 1978, the property was purchased by Bell Laboratories. Local citizens campaigned to save the site from demolition. The group was successful and Warren Township acquired the house and surrounding property in 1980. Since then, the house has been under the auspices of the Warren Township Historic Sites Committee. It was listed on the New Jersey and National Registers of Historic Places in 1988. Like all historic houses, it has undergone various phases of rehabilitation and restoration. Most recently, during the summer of 2013, the exterior clapboard was repaired and painted, front porch repaired, and its windows and shutters refurbished. Today, the house serves as a museum of Warren Township's history in conjunction with the nearby Bethel Meeting House.